Do you have questions about your IR35 status or need a contract review? At The Crew, we answer questions related to contract reviews and IR35 status' every day. While we have a great understanding of this very technical and somewhatcomplex area, we are very proud of our associate membership with Bauer & Cottrell, specialist IR35 and NIC/tax advisors. This highly regarded team, headed up by Kate Cottrell, is staffed by ex-Contributions Agency/HMRC inspectors with vast experience of all aspects of HMRC Employer Compliance. As a contractor, giving proper consideration to your IR35 status is a critical starting point, as it will fundamentally affect how you choose to operate. More importantly you will be in a better position to establish what your tax and NIC liabilities are from the outset enabling you to plan and make appropriate business decisions. The benefits of accessing such expertise as that of Bauer & Cottrell, through being a client of The Crew, are obvious and invaluable. We are therefore pleased that as a client of The Crew, you will gain access to free advice and discounted contract reviews, not from accountants, but from the experts themselves. Kate and her team are recognized as leading UK experts in their field. They undertake thousands of contract reviews each year and they have defended several hundred tax/NIC/IR35 status investigation cases – and impressively, they have never lost a case. Kate Cottrell was engaged as the IR35 expert on the OTS (Office of Tax Simplification) team tasked with the review of IR35 and she also sits on the HMRC IR35 Forum which is advising on and monitoring HMRC’s administration of IR35. Kate is also a regular technical contributor to the contractor web sites. 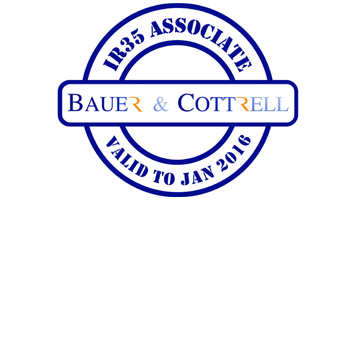 Bauer & Cottrell very carefully select their associate members, only accepting those who have committed to ensuring that their staff, clients and potential clients have access to the latest information, guidance and support on IR35 subjects and share their values of honesty and integrity. Clearly, this rings true with us at The Crew, as we are always striving for excellence. The directors of The Crew regularly attend Bauer & Cottrell’s IR35 workshops to ensure we ourselves are up to date with the latest IR35 regulations in order to best serve our clients.